Lattice Patio Covers and Pergola Patio Covers are great way to enhance your backyard space and add value to your home. Our aluminium is made from the highest quality materials and undergo a 21 point inspection from start to finish. We have several choices for rafter and beam end cut, like our Patio Cover Scallop Cut that offers soft curves or our Patio Cover Corbel Cut that gives it the added extra detail. We also have the Miter Cut or Beveled End Cut for the patio cover that should look more traditional. All of our patio covers are wood grained embossed that will make your friends and family wonder, is it really aluminium? You can choose our standard "H Post Design" or our Roman Column design with a double beam. Either of these will provide strength and durability to your patio cover. All our patio covers come pre painted with a lifetime material warranty. Order your patio cover today and receive our current promotional discount. Our Lattice Patio Covers and Pergola Patio Covers come in eight colors to choose from, each providing that wood grained embossed look. 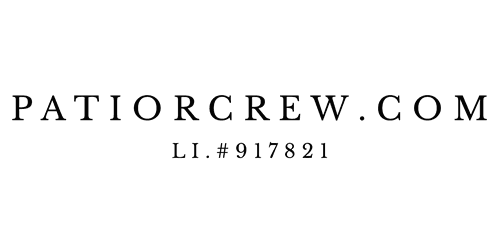 All our colors are warrantied against fading , chipping, peeling for the life of the product. We also back the manufacturers material warranty with our no hassle labor warranty. 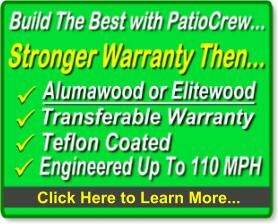 No hassle labor warranty means you will not be charged to replace any part of your patio cover for any reason. Providing you with double coverage on your patio cover. Patio Covers - can be attached to your home in many ways such as our Roof Attachment, Wall Attachment and Eave Attachment. What ever your needs, we have the solution! Our Patio Covers can be installed over an existing concrete patio slab or we can install footings for added strength. Our Patio Covers are light weight and easy to install. In most cases we can have your patio cover installed in a few hours. Our Patio Covers come complete with all nuts, bolts, screws and sealants to make it water tight. 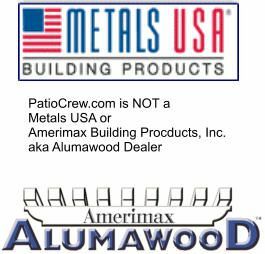 Our Patio Cover crews are factory trained and have many years of experience. Building Permits - All Building Departments require permits. Some cities do have a less than minimum "No Permit Required". You should check to see what your building department will allow before a permit is required.